How to study efficiently? how to improve study habits? study habits? ways to study? best way to study? how to study for exams? study habits of students? how to study for exams? A lot more times these Questions are asked from different people sometimes, we ask these questions, form our teachers and mentors. 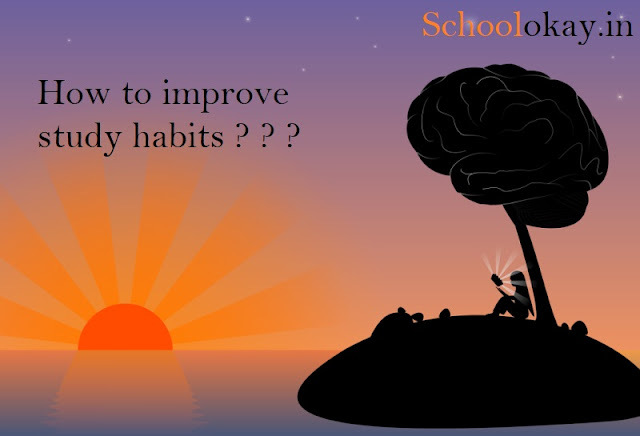 So this post is going to have the best tips about student habits and tips, the best ways to study. Thinking about Best ways to study or How to improve study habits? it's not the correct way to think if you study regularly then its obvious that you will score in your subjects. Try to learn things by writing down this is the most effective way of remembering topics. Solve the mock test every Sunday. Read topics in your free time. Have regular discussions with your friends. Habits of an efficient student? Play any game regularly or exercise this will make your mind free. No need to sit for hours you can just give regular time daily it can be 1-2 hours daily that's enough. Try to have practical knowledge instead of bookish knowledge because you will need practical knowledge in every field of life. Increase your confidence by participating in various competitions. Develop more effective communication skills by participating in school and college debates. Wake up early and study whatever you find difficult to learn. Read books that are related to your interest this will improve your reading as well as vocab. Try to practice more than your verbal learning. Travel with your friends on weekends. Bring vegetables to your house on Sundays. I m not gonna write you a lot of tips if you will follow all the above, they will definitely work for you. Student means a learner, learn things from everywhere. You need to develop the skills because books really don't always help you out with the problem. you cannot find the answers to real situations in books. Be regular in your studies and this will definitely work for you. As we always heard that slow and steady wins the race. we are at schoolokay to provide you a little help about your books and study if you have any advice and suggestion of any topic just write that in below. if you like the post don't hesitate to ask questions. like us on facebooks fb.me/schoolokay.